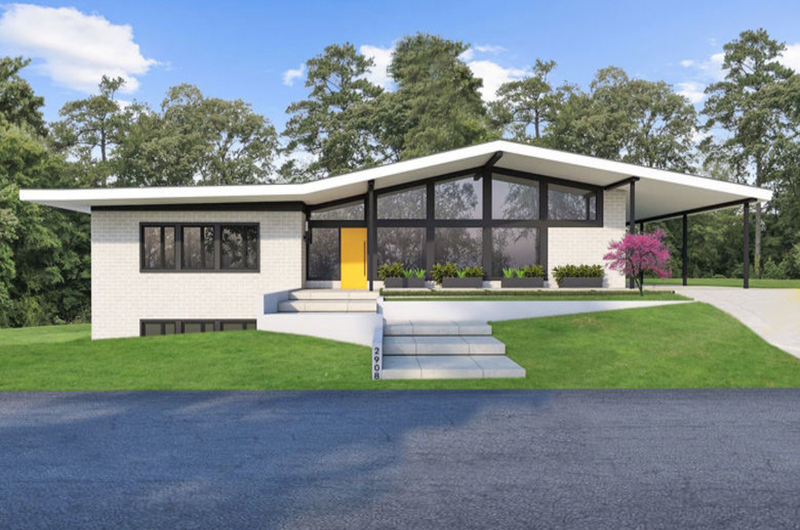 A top to bottom renovation of a late 50s home in D.C.’s Forest Hills neighborhood just hit the market for $2.695 million. D.C.-based residential developer Coba purchased the house from Washington Fine Properties in February 2018, in its original condition. WFP agents Robert Hryniewicki, Adam T. Rackliffe and Christopher R. Leary of HRL Partners with Washington Fine Properties have the listing. The home, at 2908 Ellicott Street NW, was built in 1959. Everything but the existing brick envelope of the structure is brand new. The remake was designed by Alexandria-based Akseizer Design Group. The main living space’s 12.5 foot vaulted ceiling was possible only with current steel engineering. The living room also includes walls of windows and sliding glass doors that open to a rear garden. The two-level home includes five bedrooms, four and a half bathrooms and a total of 4,100 square feet. The master suite and two other bedrooms are on the main level. The lower level has two more bedroom suites, a recreation room, wet bar and kitchenette. Roadside Development and North American Sekisui House, which jointly acquired the 10-acre Fannie Mae campus at 3900 Wisconsin Ave. NW in 2016 for $85 million, revealed the name in advance of a Dec. 1 scheduled groundbreaking. The acquisition was named the Washington Business Journal's Best Real Estate Deal of 2016. Consuming 86,000 square feet, the urban-format Wegmans will sit on the lowest level of the 1958-era Colonial-style Fannie Mae building, which will be held up by micropiles while the existing basement is excavated 8 feet. D.C.-based Roadside has a history of adaptive reuse projects, most notably City Market at O in Shaw and Cityline at Tenley. The overall $640 million project, designed by Shalom Baranes Associates, includes eight new buildings along with the repurposed Fannie Mae main building. The development team is expected to begin demo of the other existing campus buildings on Dec. 1. The City Ridge interior architects are listed as Cecconi Simone Inc. and Akseizer Design Group. Fannie Mae has relocated to Carr Properties' Midtown Center, a new complex on the site of the former Washington Post headquarters at 1100 15th St. NW.